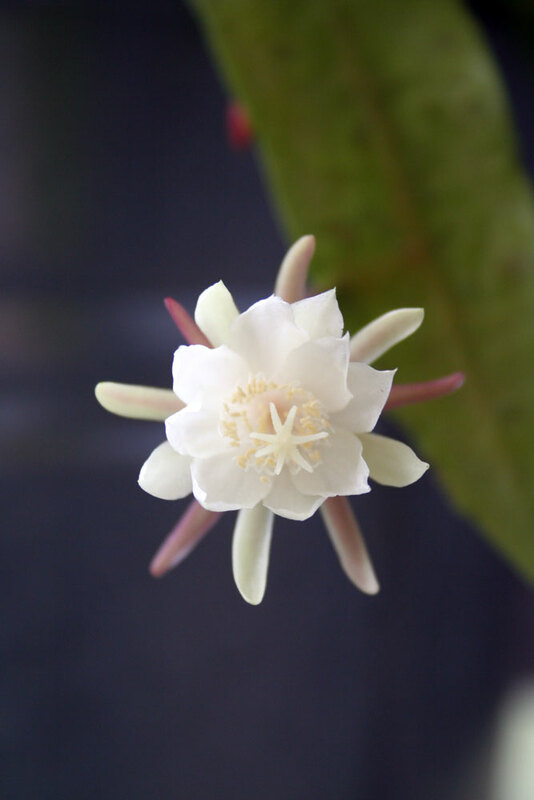 I'm sure you've all heard of 'queen of the night,' the epiphyllum cactus with spineless flattened stems and huge white flowers that bloom at night, right? Well, let me introduce you to another epiphyllum with subtler charms. Her name is Epiphyllum pumilum, but I think that she deserves her own common name, a name befitting of her graceful nature and dainty form. How about 'princess epiphyllum?' Her flowers are nowhere near as large as the queens, but she more than makes up for it. You'll see. Princess epiphyllum might not have the glamorously enormous blooms of Epiphyllum oxypetalum, but she has several things going for her. First off, if Disney movies and trashy romance novels are any indication, it's way cooler to be a princess than it is to be a queen. They just get to sit pretty and have fun all day while the queens are busy conquering foreign lands and trying to make more babies! On a less fanciful and anthropomorphic note, Epiphylum pumilum rocks for its profusion of blooms and elegant form. 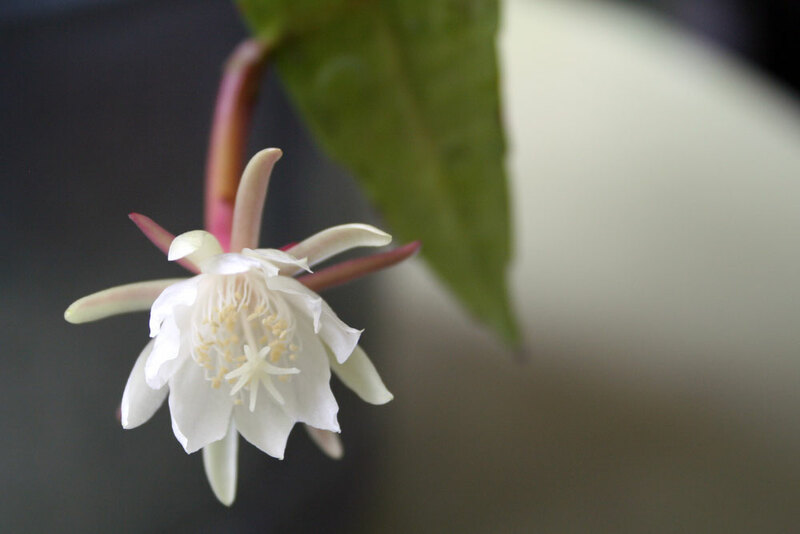 Princess epiphyllum blooms during the day with such a profusion of spicily scented flowers that you'd swear that it was covered with a flurry of big fat snowflakes. The overall form is similar to other epi cacti: a mess of flattened stems rambling every which way as if it hasn't yet made up its mind on becoming a shrub or a rambling vine. Somehow the narrowly pointed stems of E. pumilum manage to pull off a tidier, more graceful appearance than that of her relatives. Here's another reason I love this plant. These flowers bloomed on cuttings that were rooted as early as this winter, indicating that it would be a profitable choice for commercial growers looking to get retail ready plants in a year or two. In case you didn't get that, it can bloom after less than a year! I could just be me, but the fact that princess epiphyllum blooms during the day, is easy as dirt, has yummy smelling flowers, an attractive form, and is also quick to bloom... these features tell me she's a winner. Lovely! I love epiphyllums, I wish they were more widely available and I had the space to grow a bunch of them. She's beautiful. Princesses are definitely cooler than Queens, and have a more precious life. 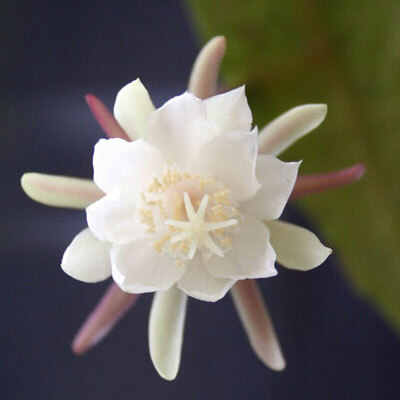 Hi Steve, i have the E oxypetalum, which is difficult for me to see because i am not always at home. 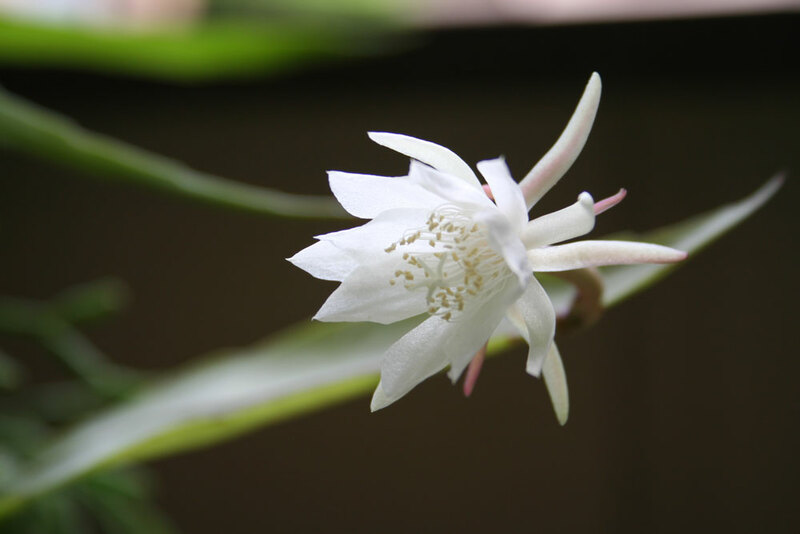 I didn't know there is an Epiphyllum which blooms at daytime. Oh how i wish to have a specimen of that one! Now I want one princess to accompany my queen of the night. If they bloom at the same time, the scent will obviously last longer. College Gardener: I wish they were more widely available too! They're way too easy and beautiful to be left out of any garden center's order... sometimes if you ask the manager they can make an order for you. Andrea: Many epis bloom during the day but the most commonly grown is night blooming epiphyllum. If you ever find a friend with one, ask for a cutting! Bom: They smell so good! Mine is actually starting to work on new flower buds right now, so it does seem to be prolific as they say.